Today is a special day in our house - Adoption Day! Three years ago today, in the late afternoon, we drove to a friend's house. This friend runs a wonderful dog rescue, and it was time to pick up our new addition. About five weeks prior, she had called us with the wonderful news that not only had she found one potential dog for us, but two. Hubby has animal allergies, so the dog we added to our family had to be what we call a "hair breed" and not a "fur breed". Limited dander was a MUST! We were also interested in a small breed - in the 15-20 pound range. We preferred a female, but the right neutered male would be acceptable. And, we wanted a dog instead of a puppy. We had looked on Petfinder.com for nearly three years with no success, and my friend found us not one, but two, dogs. In a week. So she sent us the photos. We had our choice of an extremely adorable little Silky Terrier or an extremely adorable Bichon Frise-mix. All four of us had our eyes IMMEDIATELY drawn to the little blonde beauty on the screen, each of us choosing names we thought would be appropriate for her. Each name just somehow not quite right. And then, Hubby said her name. And somehow at that moment, we knew she belonged to us because it was the perfect name. At first, we knew it was perfect because of her color, but now we know it's the perfect fit for her personality. I won't disclose it here - she deserves her privacy as much as my children and husband. But let's just say, it is THE MOST PERFECT NAME FOR A DOG EVER! Really. That fateful afternoon, our little beasty made the fateful trek from a different rescue in an area where they have a high-kill shelter. Her savior, the operator of that rescue, would be driving her to our friend's house, and we would pick up 4LPA there. She was waiting in a small pen in my friend's garage. And she stood up on her little back legs and danced when she saw us. My first reaction: To whom do I write the check, and for how much? Where do I sign? She's coming home with me. Honey, go get the leash! And she's been my faithful companion ever since. Always by my side. A real Mama's girl. Our lives have never been the same. We are so blessed to have the most perfect dog in the universe. She came housebroken, and after a little work, remembered some basic commands. She has even learned a whole bunch of new tricks, thanks to the patience of Princess (and constant stream of treats). Her favorite foods are cheese, yogurt, peanut butter, and whatever you happen to be eating at the moment. She loves frozen mangoes and frozen strawberries and frozen mixed vegetables (but she'll spit out the green beans). She is spoiled rotten because she deserves it. She has more sweaters in her wardrobe than I do. She is so wonderful with children, and even tugs on the leash when we are at the park to go by the sandbox - that's where she greets her "fan club", the pint-size future dog-owners of America who pet her with chubby little sandy sweaty hands and admire her little stubby tail. They are frequently kissed by a little pink tongue as a reward for their kind behavior, and squeal with delight because "it tickles". She greets everyone she sees like they are her long lost friend. Everyone should live "Love Thy Neighbor" like my dog - the world would be a much better place! If you and your family are considering adding a pet to your family, go to a shelter or a rescue organization. When you adopt a shelter pet, you save two lives - the one you take home with you, and the one that can now be taken off the streets and given safe haven. Our perfect dog was waiting for us there - yours could be, too. 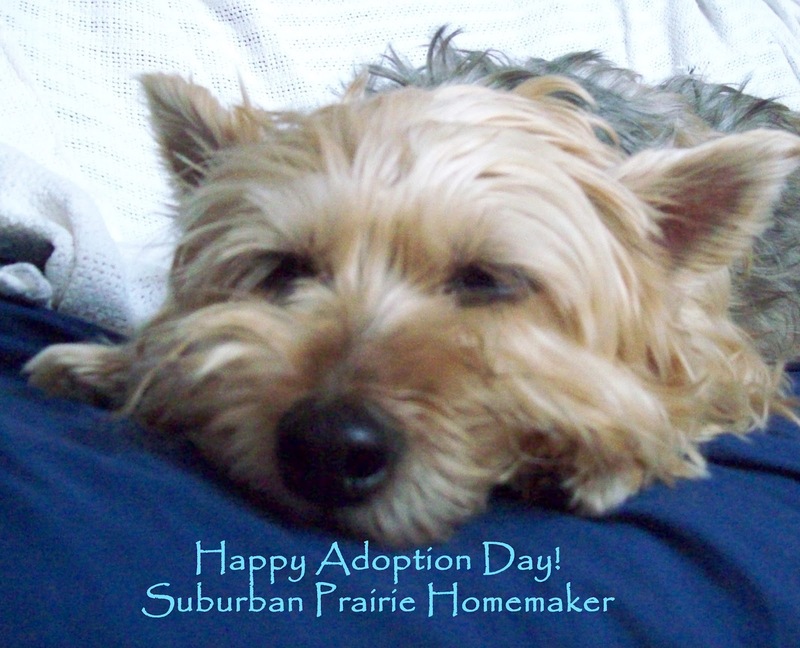 Happy Adoption Day, 4LPA! We love you more than all the cheese in the world can say, and we're so glad we are yours! At this time, we have a beautiful Brittany Spaniel mix. My Rooster found her roaming as a pup three years ago. She is such a wonderful friend. Happy Birthday and many, many more!! !